I am happy to report that we have spent some time reading poetry this week. Let me say up front that this is actually not something my girls look forward to. I do look forward to it, but my pulling out a book of poems is most likely to elicit a groan from my girls, and especially from Lulu. Louise is still very much enamored of being read anything aloud, so she doesn’t complain as much. I believe that this is a worthy use of our time, not to mention enjoyable for me, so I soldier on. Most of the week we read from Dark Emperor and Other Poems of the Night by Joyce Sidman. This poetry collection won a Newbery honor this year, a feat that I think is impressive, given that it’s an award undifferentiated by genre. Of course, it was also shortlisted for a Cybil, as well as honored by several other awards which you can read about on the author’s website. I have a confession: when I checked this book out, I thought it had won a Caldecott Medal. When I started reading it to my girls, I thought the library had made a mistake and had put the wrong type of sticker on the spine. It was after I began writing this review that I realized that yes, this book did indeed win a Newbery honor. All of this is certainly not to say that I don’t think it’s deserving; rather, it is to say that the illustrations in this book are wonderful. Rick Allen used a method called relief printing to make the gorgeous illustrations. It’s similar, I think, to the method used in this year’s Caldecott winner, A Sick Day for Amos McGee, which I love and reviewed here. The illustrations in Dark Emperor are as lovely as the poetry. Can’t you see them now? I love these word pictures. The other really neat thing about this book is the fact that each two page spread contains a.) a poem b.) an illustraton and c.) a column of well-written prose that gives the details of the subject of the facing poem. In other words, this book could double as a science book. I love that. In fact, I could’ve used it when we studied owls or amphibians or spiders earlier this year. 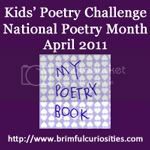 We also played along with the Kids’ Poetry Challenge at Brimful Curiosities this week. I let the girls pick a poem from Dark Emperor to illustrate, and they both chose the lovely “Snail at Moonrise.” I chose the last seven lines of the poem for the girls’ copywork (a stretch for five year old Louise, really, but she handled it beautifully! ), and they drew their snails. I complicated matters by offering the girls some sparkly paint in squeeze bottles, so the project suddenly became less about the drawing and more about the fun paint they got to use. That’s a part of art, too, though, isn’t it? Read more Poetry Friday links this week at Madigan Reads. Oh, the poor snail! I’m impressed you found one outside. Snail shells are fun to draw and the artwork is lovely! While I’ve heard of Dark Emperor, we haven’t read it yet. Did the informative prose help make the book more interesting for your girls? I’ve noticed my daughter needs to be in the right mood in order to enjoy her poetry. It’s best not to force it on her but slide it in with the other books we read. I’ve also noticed her favorite poems tell a story that is easily understood. This week we discovered she is a fan of Ogden Nash after reading “The Tale of the Custard Dragon” and “The Adventures of Isabel.” However, she chose to illustrate “Rabbit” by Mary Ann Hoberman. I’m not sure if the information helped the girls like the poetry better, but I enjoyed it. 🙂 Poetry tends to be something they complain about but actually enjoy once we engage with it. It sometimes is really over their heads, but I know it’s worthwhile for them to hear it, anyway. You’re right about the narrative poems, though. When we’ve read stories in verse (like the tale of the finding of King Tut’s tomb), they are enthralled. Thanks for the push to get back out our art supplies! It has been a while, but we’re enjoying it! This one is on my list to read. I love how her books make excellent science tie-ins. Her “Ubiquitous” book is a great science-as-poetry book too. In fact she has four or five of those types of books. Her “Eureka! Poems About Inventors” is a fun one. Oh I’m going to have to look for this one. It sounds like something both my boys would love, but especially my oldest. Susan @ learning ALL the time!! Oh, you’ve sold me! I’ll have to check it out for sure. The science text did help my boys swallow the poetry pill. It’s funny; they’ll gobble up rhyming picture books with delight (still — they are 4th and 6th grade now) but if I label something as “poetry” they scramble for the hills. But they were willing to sit and think about how well the poetry illustrated the facts on the opposite page.